For decades people have debated the effects of open adoption and whether ongoing contact was harmful to the individuals involved. Of particular concern was whether it caused problems for children. Some argued that open adoption created confusion about who a child’s real parents were, which lead to issues with self-esteem and identify. But now the co-author of a groundbreaking study on open adoption says his findings contradict these concerns and others regarding birth families and adoptive parents. 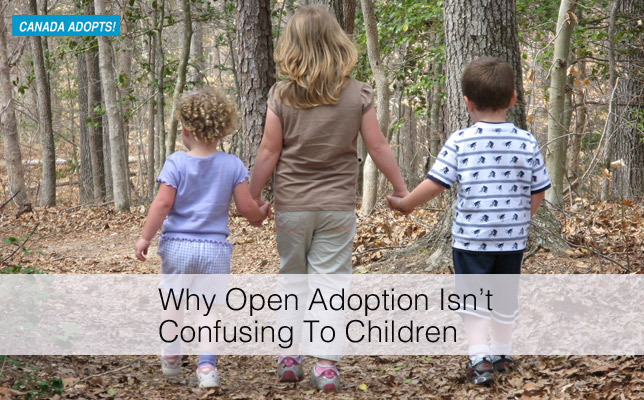 The way he sees it, open adoption requires a whole new way of thinking of adoption. According to Grotevant’s study, children know the difference between adoptive and birth parents and understand their different roles. Unlike in closed adoption, where children filled in the gaps of their birth family history with fantasy, in open adoption they know that their birth relatives are real people. Even if they’re not regularly in contact with their birth family, they have access to information about what they look like, their personality traits, their medical history, and often the reasons they were placed for adoption. The frequency, type and directness of contact between children and their birth family varies widely from one relationship to the next and changes over time as circumstances change. What matters most, according to Grotevant and what really hit home for me, is not the frequency or type of contact, but what he calls the “perception “ of it. “In general, children who had contact were more satisfied with arrangements than those who did not. When family members were dissatisfied with their contact, it was almost always because they wanted more (rather than less) but were unable to bring it about,” he says. Adoptees aren’t the only ones who benefit from open adoption’s ongoing contact, according to Grotevant. Birthmothers do too. Until the 1980s, when his study began, most adoptions were closed. Women gave up their parental rights and had no contact or information about their child’s whereabouts or well-being. But in today’s open adoptions, birthmothers are actively involved in choosing parents for their baby and have the option of keeping in touch with their child and their adoptive family after placement. Some people worried that this type of ongoing contact would impede a birthmother from grieving her loss and have a detrimental effect on her relationships and mental health. In fact, Grotevant says, researchers found the opposite was true. “Birth mothers in more open adoptions who were more satisfied with their contact arrangements had less unresolved grief 12-20 years after the placements than those involved in closed adoptions,” he says. As for ongoing contact for adoptive parents, his study found that it also has advantages. Again, Grotevant compared the concerns that people had back when the study started with the reality today. Initially, adoptive parents were fearful that birthparents would be looking over their shoulders or showing up unannounced on their doorstep to take back their child. Again, his research found the opposite to be true. “Adoptive parents were least afraid in open adoptions, often because the birth and adoptive parents had had a conversation about this issue and the birth mothers would often say, ‘Why would I take my child back? I placed my child with you. I just want to make sure that my child is OK,’” Grotevant writes. Although the study looked at most of the major stakeholders in adoption relationship, Grotevant did point out that one voice was msising: birthfathers. Although other research suggests that birthfathers have some of the same wants and needs as birthmothers, they could also create new complications and challenges to family relationships created through open adoption. And Grotevant doesn’t shy away from saying these types of relationships are more complicated than others. But he also points out that they can be more rewarding and, like any relationship, require work. He identified three keys to success: flexibility, strong interpersonal skills, and commitment to the relationships. The good news is that all of these skills can be learned. The bad news is that they need to be supported by post-adoption professionals and of now, these resources are lacking. And although his findings didn’t address the topic, the legal supports needed to resolve major disagreements between birth families and adoptive parents are also largely absent. With all of the stereotypes and myths surrounding open adoption, hopefully his research will serve as a reality check and put people’s questions and concerns in the proper context. At the same time, open adoptions are still relatively new and evolving. It will be interesting to see how they — and the children at the centre of them — develop in the years to come.